Learn about each step from first planning all the way to caring for your planted trees. These are the steps we’ve found that give the best return on your investment of time and money in your use of trees to reach your conservation goals. Learn the how-to, resources available and tips that all work together to raise your success rate. Always be sure to check out our Conservation Corner article base to aide you in your planning and on-going conservation efforts, as well as our Announcements page to view the news in the district regarding programs, workshops, funding assistance and more. 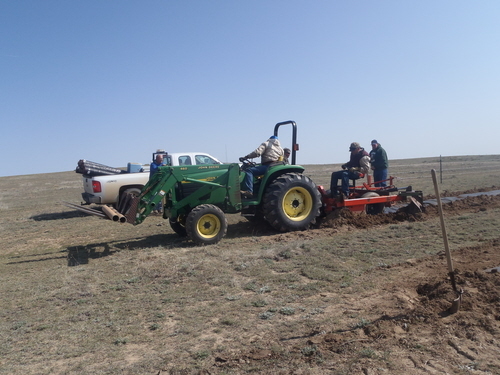 Straight from our neighbors to the north – Laramie Rivers Conservation District – Martin Curry shares a planting day montage that shares pre-planning steps, site prep, planting & drip irrigation information all in one short video. *The multi-row windbreak shown installed in the video included Cargana, Ponderosa Pine and Chokecherry species. Visit our Windbreak section in Conservation Corner to view the species we love for fast returns on your windbreak investment for our area, from single to multi-row plantings. Video shared courtesy of the educational YouTube channel: Barnyards and Backyards: Resources for Small Acreage Living in Wyoming. Planting trees and shrubs takes work and money in the beginning but will provide beautification of your land, screening of sights and sounds, shade and energy conservation, wildlife habitat, protection of livestock and crops, erosion control, and provide plant diversity of the land. Thinking about what your goals and limitations are before you order your trees and shrubs pays off and we are here to aide you in gaining the best returns on your investments in improving your land. How big will it get? Is your planting project a windbreak, shelterbelt, or living snow fence? Are you trying to create wildlife habitat or control erosion? What is the average life expectancy of the tree? 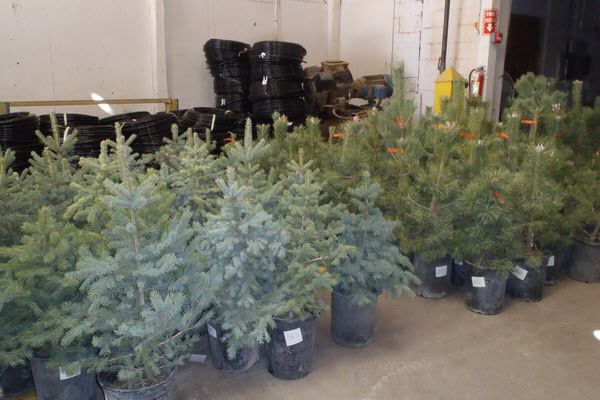 Answering these questions will determine what type of trees or shrubs will suit your needs. Select the correct species for the job because with all living things, plants have specific requirements necessary for their survival. Every tree or shrub must exist in that spot for its lifetime. Be sure to consider the plant characteristic before you buy. Keep in mind that all your plants must be able to tolerate some of the following conditions on the plains of Eastern Colorado, if not all of them: high elevation, poor soils, high winds, low annual precipitation, probability of predation, rapid changes in temperatures, extreme cold, insects and diseases, invasive grass, weed and competition, and heavy snows. The trees and shrubs the Forest Service and nurseries grow for us are specially selected for survival in the Colorado environment. Various trees and shrubs will have different characteristics and serve different functions as they mature. Some trees and shrubs are good for windbreaks and others are better suited for wildlife. Which plants you select will depend on the end result you hope to achieve with the planting. Tree Selector – Simply choose the features and uses you are looking for and view the details of trees available through our annual Tree Program that match your requirements. Conservation Corner – Learn more via our article knowledge base, designed to aide you in determining your conservation goals for your place, from Small Acreage & Horse Farm Management to Grazing Management to Windbreak 101, you can also learn more about the pests, beneficial insects, noxious weeds, and read about local residents who have successfully implemented a variety of projects. Additional Resources– There are a great many partners in the Conservation community – Many have YouTube channels you can subscribe to, guides to follow, and articles that will aide you in your efforts. In addition to our own publications, educational offerings and publications, we are constantly on the look-out for new items to share with you in our Resources section. And, as always, you can Contact Us for assistance in planning and finding funding for your conservation plans. Know what it takes to do the job correctly. A properly planted and maintained tree will grow faster and live longer than one that is incorrectly planted. If you only have the weekend to install the planting then stick to a project size that is manageable. If you’re also scarifying and hand-tilling the ground, installing weed barrier, shingles and tree guards then the project can be very time consuming and hard work. The survival rate increases the sooner you get the plants in the ground after you get them. Plant trees and shrubs in a competition free environment. Your project will fare much better if you plant in freshly tilled soil which is completely free from invasive vegetation. You should till the soil as deep as you physically can and as wide an area around each plant as you can. If you don’t have adequate site prep you won’t have acceptable plant survival. Preparing the ground in the fall before the planting is desirable for most soils in the area. Before digging call your local utilities to identify the location of any underground utilities. We highly recommend the use of polymer and weed barrier at a minimum (and either fencing and/or individual tree guards for areas prone to foraging by domestic or wildlife animals) simply because, over the past 30 years, we have seen survival rates go from 30 – 35%, sans survival accessories to survival rates of 90-95% when a minimum of polymer and weed barrier solutions are implemented in the beginning. We can source a variety of drip irrigation and other survival supplies throughout the year, so if our online store isn’t open, Contact Us – we may have it in stock! Remember! Improper care of seedlings between the time of delivery and when they are planted is one of the greatest causes of mortality. Protect your investment. Protect your trees from damaging winds during transport. Do not store seedlings in heated buildings or where they are exposed to warm air, sun, or wind. If planting is to occur within 48 hours of delivery, leave bare root bundles intact and store in a cool place (under 50F). Bare root trees have no soil on the roots; they must be planted when they are dormant to avoid drying out. The roots must be kept moist until planted. Keep bare root stock out of direct sunlight by placing them in shade. Store bare root stock inside the garage, root cellar, basement, your refrigerator or wherever it’s dark and less than 50 degrees Fahrenheit. 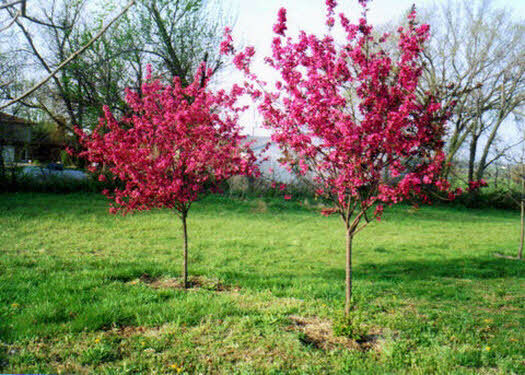 If you can not plant right away you can store the trees or shrubs for a short period of time. Superior long term storage is called “heeling in” where you separate the seedlings, place them in a trench, cover the roots with loose soil, and keep moist until ready to plant. If you leave them in the package they came in, fungal growth may occur. Do not store your trees in a bucket of water; they may drown if you do this. Trees are not a wetland plant. 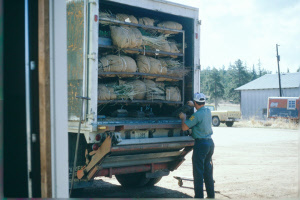 The root system must stay covered and protected throughout the transport and planting process. Fine seedling roots are extremely susceptible to drying; it takes only a few seconds of exposure to hot, dry conditions to damage roots. Store potted stock in a protected, cool location such as the garage, on the north side of the house, under the porch or in the shade of mature trees. Keep the soil moist until ready to plant. Potted stock can be stored this way for a while but the sooner you plant the better the survival rate will be. Start early when it is cooler and less windy. Do not use manure or nitrogen for ‘extra’ fertilization during the planting of seedlings. If needed, we do carry fertilizer tablets to use during your planting day. (for fertilization guidelines in future years, please see Caring for your Trees. Have your survival accessories prepped and ready for placement/use as you move down the line of planting. *Increase your tree survival rates by using a minimum of weed barrier (rolls or squares) and polymer. Mark off proper spacing ahead of time to place each seedling in the space it requires for optimum growth. Seedlings should be removed from the containers just prior to planting. Plan ahead to maximize as much prep work as you can (but not too early, as holes can fill back in with dirt or water! ), have your supplies ready (polymer, fertilizer tablets, etc.) in order to minimize the amount of time your bare root seedlings are exposed to the wind and sun prior to being settled in their new home. Dig a round hole at least one foot in diameter. Make a small mound of soil in the bottom of hole. Take the seedling from the bucket of slurry and spread the roots out in all directions, using the mound as a root support. Pull loose soil back over roots, filling the hole halfway. Lightly tamp soil down or fill with water. Backfill the rest of the hole and tamp soil again or re-water. Do not compact the soil by tamping wet soil. Soil compaction eliminates oxygen, which roots need to survive! Be sure the seedling root collar (where it was planted in the nursery) is at the finished soil level. Watering is the best method to settle the soil, eliminate air pockets and provide moisture to the root system. Completely remove seedlings from plastic tube, tray or pot. Follow the same planting instructions as for bare root, but do not disturb the roots. Make sure the root ball does not become exposed after final watering. 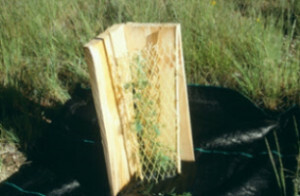 Water each seedling planted with one to two gallons at time of planting to minimize shock to the tree and aide the root system in establishment. Water is the limiting factor for any plant growth and is particularly true of young seedlings with limited root capability. For best results install a drip system. Installing a drip system with weed barrier fabric will get the best results and save time watering in the future. If you install a drip system use a one gallon per hour emitter. *A drip system allows you to turn it on when you go to work and water up to 500 plants simultaneously while you are away. If polypropylene weed barrier fabric is used, a reasonable watering interval should be 8-10 gallons every 20 days. 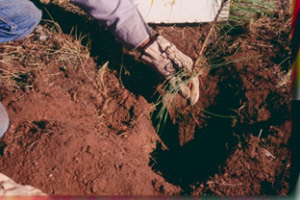 It is better to apply infrequent heavy doses (known as “deep-watering”) than light doses on a frequent basis – Constant, light watering encourages the tree roots to stay close to the surface, whereas deep-watering at less frequent intervals encourage deep root growth -increasing stability, strength, drought tolerance and access to nutrients for your tree. Water trees with about one to two gallons of water minimum per tree per week right after the planting for best results. Water periodically throughout the first two years depending on soil types, recent precipitation levels, presence or absence of mulch, vegetative competition, species composition, wind, day temperature and relative humidity. Water in winter about once a month when the weather is nice enough to prevent water freezing around the trees before it is absorbed into the ground. Do not water if the ground is not thawed enough to absorb the water. Regular watering maintenance should begin mid April to early May, the typical time trees and shrubs in our area begin to break dormancy. *Make sure soil has thawed before you begin to water. Fabric mulch reduces weed competition and soil water loss and can be obtained from the Double El/Agate Conservation District. Mulch allows rainfall to pass through the fabric to the soil, restricts weed growth and permits oxygen exchange between the air and the soil. Installation of fabric mulch on large plantings can be done efficiently by renting weed barrier equipment. *We have witnessed land owners who, 15 years later, are still struggling with plantings that did not include weed barrier installation, and struggle to find an easy way to implement such protection, now, while seeing the benefits of other plantings, nearly as old, that included weed barrier from the start. We highly recommend installation of weed barrier, to enhance your rates of success and lower your maintenance costs. Surface mulch materials also aide in moisture retention by reducing soil evaporation. Don’t pile wood chips or sawdust more than 3-4 inches deep and use dry material. Avoid grass, hay, sheet plastic or weed mulches. Install animal protection because the plants are extremely palatable and easy to eat so they may be favored over native vegetation, especially during the first 2 winters. Fencing can keep browsing of livestock and some wildlife species to a minimum. There are spray repellents on the market to discourage wildlife, though they have not traditionally been proven as effective as other methods, such as wildlife fencing; however for fencing to be effective against deer and elk, it must be at least 10 feet high and installation of such may be either impractical and/or extremely costly. One homemade deer repellent reported as effective, can be made by mixing whole eggs with tap water to form a 20-percent solution; strain and spray on seedlings. Another homemade method, currently under research, is the use of 6.2-percent hot sauce (Capsicum pepper concentrate). If the deer problem persists, a combination of methods may be required. Having protection from the wind and sun, like wood roofing shingles, snow fencing, or wooden pallets for conifers, is also important to reduce dehydration and direct sun. Northwesterly winds during the winter can severely damage recently transplanted evergreens. Prune as necessary as stem and branch damage occurs. Snow breakage, insect and disease kill, and die back are common phenomenon with trees. Simply follow good pruning techniques to reshape damaged plants. Prune from mid April to the first of June just before bud break. Pay particular attention for insect activity just after bud break. Check the plants, weed barrier, animal protection, sun screens, for unwanted vegetation around trees, and rodents’ activity in the soil. Eliminate weeds around each seedling for at least two feet. This can be done by hand pulling, mulching, mowing (watch out for the seedling), or hoeing. Weed control will discourage rodents from chewing seedlings. 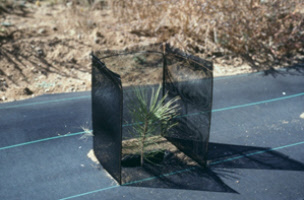 Commercial tree guards can be purchased from Double El/Agate Conservation Districts, or window screening can be used to make a rodent guard; use poisons as a last resort. Eliminate pocket gophers by placing a half stick of chewing gum in the burrow. If you are encountering Prairie Dog infestation, contact us for assistance and options to address. Replace dead trees as needed to keep the row trees growing uniform. The average survival rate is about 80-90% per year. A 50% survival rate is discouraging but not alarming. Simply emulate nature and keep planting until your project reaches the success you require for your plans. If you are encountering sustained difficulties in an area, contact us, so we can assist in determining any causes that may not be readily apparent.